Car serviced by local dealer only a few miles before engine failure due to timing chain tensioner problem known about by dealer since 2012. Dealer admits knowing and not informing us so we could make repairs to prevent engine failure. On my Daughters very well maintained 2009 VW GTI with 89000 miles , the Timing chain tensioner should not fail and destroy the whole Engine . Then to find out that VW knows that the tensioner is junk and came out with a redesigned one ..GREAT . but why wont they tell the Customer about it before it breaks and now the whole Engine is JUNK. Should be a Recall . Toyota recalls any little possible problem or extend Warranty on problem items. I'm 100% German , always own German cars , oh yea and I'm a Master Mechanic , trained in Germany . BUT I AM NOT PROUD THE GERMAN CARS ANYMORE OR HOW THEY DON'T STAND BEHIND THEIR PRODUCT . VERY SAD. ....almost forgot VW of America told me that they are sorry for my trouble but can not offer any help or assistance and that I should have bought an extended Warranty . ..THANK YOU V.O.A. For several weeks, I noticed occasional misfires upon startup and acceleration. Then, the vehicle began running loudly and consuming a lot of oil. The vehicle also shuddered while driving. One morning, the car shuddered and bucked while I attempted to start it, and ultimately failed to start after several attempts. The engine light illuminated. This is not a battery issue; the battery is only a few months old and was tested in the past few weeks (holds charge at 100%). I have had the car towed to two mechanics and the problem was diagnosed as a timing chain tensioner failure leading to catastrophic engine failure. According to the first mechanic, the entire engine needs to be replaced for approximately $4500. According to the second mechanic, the timing chain tensioner needs replacing and the top half of the engine needs to be repaired, leading to a quote of $2800 for repair. The mechanic stated to me that he has already performed approximately 8 of these repairs on Volkswagens in the last year and directed me to investigate a pending New Jersey lawsuit against Volkswagen for the same issue. This appears to be a common complaint. Volkswagen is very well aware of the potential for failure of the 2.0 TSI engine timing chain tensioner. The ratchetting latch/pawl of the tensioner that should prevent the tensioner from retracting after oil pressure bleeds off when the engine is shut off is poorly secured by the spring clip. 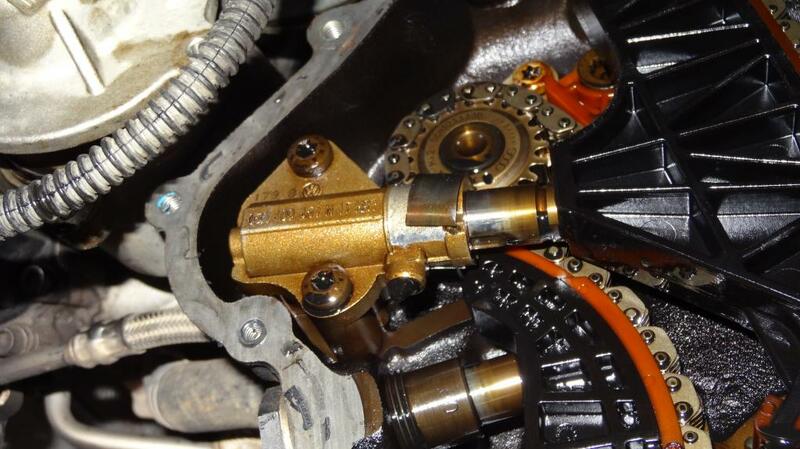 If the clip dislodges from the correct position the cam chain will not stay tight and easily will cause the cams to jump timing and allow the pistons to hit valves. Volkswagen and Audi TSI engines with the timing chain were expected to be more reliable than a timing belt engine. 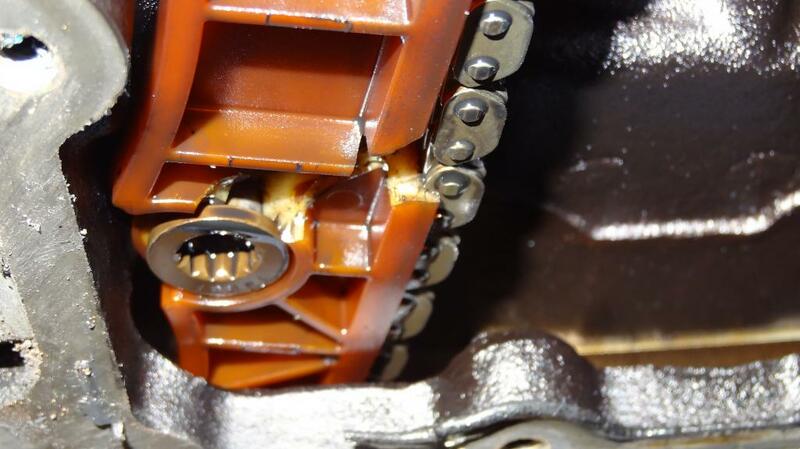 There is a TSB that has been made available to the dealerships to check for the potential failure of the tensioner when a vehicle is being checked for other problem. There has been is no recall or attempted notification the potential thousands of owners that I am able to find. The attached photos show the defective tensioner with the spring clip clearly out of position and the forward fixed cam chain guide that broke because of the chain jumping teeth on the sprocket. Any damage to the valves, head and further engine damage will be posted as soon as available. All calls to Volkswagen Nationwide and local dealerships have made it clear VW will pass on 100% of the catastrophic engine damage cost to the customer unless the tensioner engine fails before the 50 thousand mile powertrain warranty. The defective tensioner has been redesigned but the bad tensioners are possibly present in VAG TSI engines from 2009 to 2014.